KENNEDY SPACE CENTER, Florida (CNN) -- The space shuttle Discovery lifted off Sunday evening on a mission to the international space station, where Discovery will deliver supplies needed to expand the station's crew to six people. 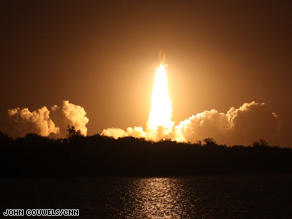 Discovery lifts off Sunday, four days after the launch was postponed because of a leaky gas vent line. The shuttle launched at 7:43 p.m. Sunday, after NASA engineers repaired a leaky gas line. The hydrogen leak caused the cancelation of Wednesday's planned launch. Lead shuttle flight director Mike Moses said repairs on the hydrogen gas vent line went smoothly. The line funnels flammable hydrogen away from the launch pad so it does not present a fire risk during takeoff. The seven-member shuttle crew will be delivering the final parts needed for an expanded solar energy power system that will allow the station to double its crew to six people. The shuttle crew also will be dropping off Japanese astronaut Koichi Wakata, who will replace NASA's Sandy Magnus on the station. The debris, moving about 20,000 mph, came within three miles of the station but caused no damage. The launch had been delayed previously to allow time to check a "flow-control valve in the shuttle's main engines," NASA said this month. That resulted from damage being found in a valve on the shuttle Endeavour during its November 2008 flight. Three valves were cleared and installed on Discovery, it said.